This is a nice way to cook a whole fish per person. For the herbed oil, I mixed a teaspoonful of pistou (you could use pesto, or whizz up some basil leaves with oil in a blender) with some extra virgin olive oil. In an oven-proof dish, layer the potatoes, onion and tomatoes and season. 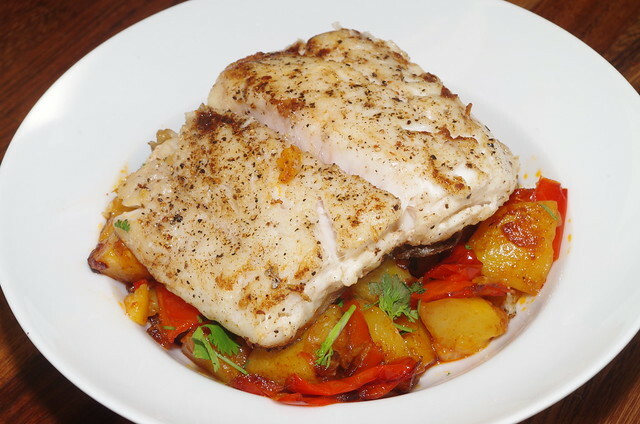 Make a few slashes on one side of the fish and put a half slice of lemon in each slash. Put the fish on top of the vegetables. Season again and pour over the lemon juice and wine. 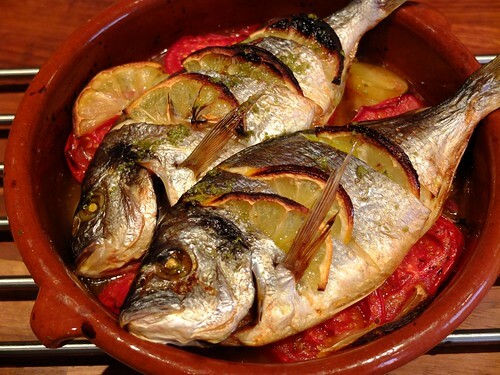 Then drizzle with olive oil and bake in a 170C oven until the fish is cooked. Serve in a shallow dish, to take the juices, drizzled with the herbed olive oil and garnished with chopped parsley. Aioli would work well with this and a glass of the same wine you cooked with would be even nicer. 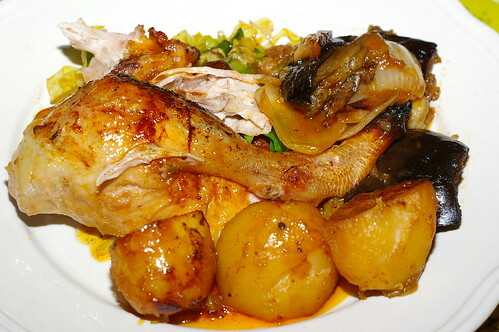 Massaman-style chicken and potato curry, a photo by La belle dame sans souci on Flickr. 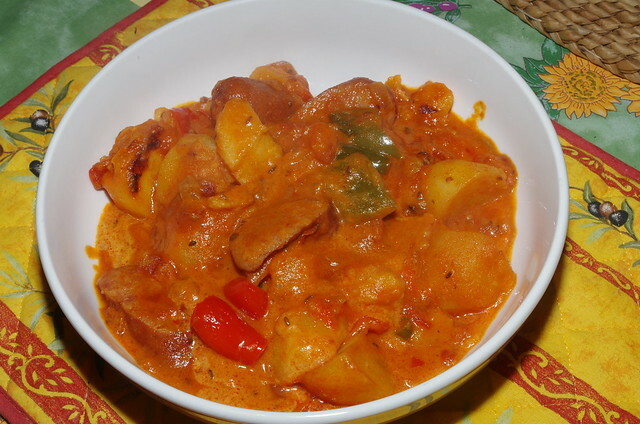 I like potatoes in a curry, they absorb the spicy flavours perfectly. 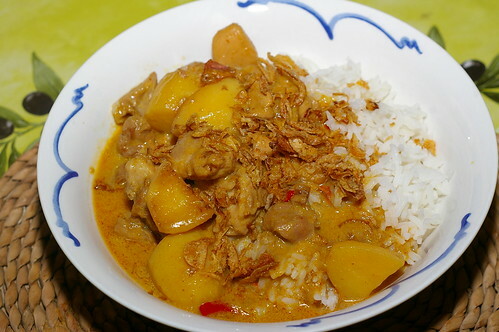 Massaman is a Thai style of curry that comes from the southern, Muslim, part of the country. 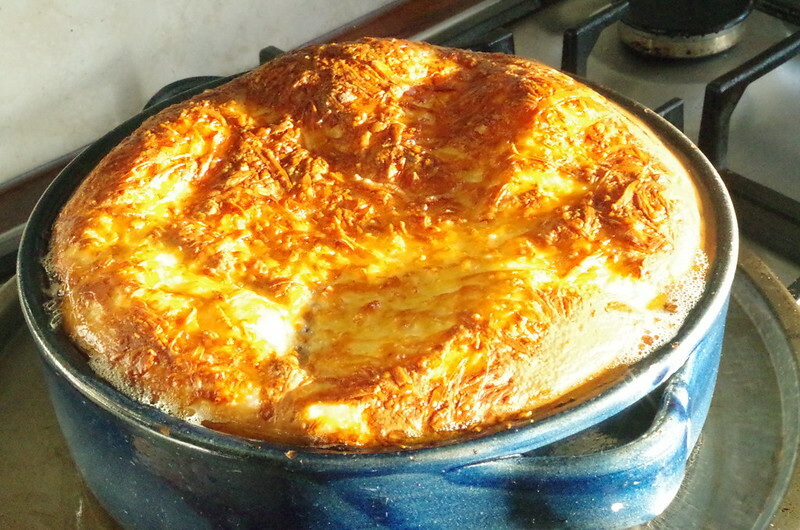 It is traditionally made with beef, but it works well with pork (obviously non-Muslim) and chicken too. You can buy ready made Massaman pastes in oriental shops but I also like the yellow Thai curry pastes as well, which seem to have a similar fragrance and flavour to a Massaman paste but are lighter in colour. This curry used chicken thigh meat and new potatoes, red chillies, garlic, chopped onion, a tablespoon of yellow curry paste, a tablespoon of fish sauce, 400ml of coconut milk, a small can of coconut cream and some bought crisp fried shallots. I sautéed the onions, garlic and chillies in hot oil in a wok and then added the potatoes and chicken, cooking until the meat had lost the pinkness. Then I added in the paste and fish sauce, stirring so that everything was coated. 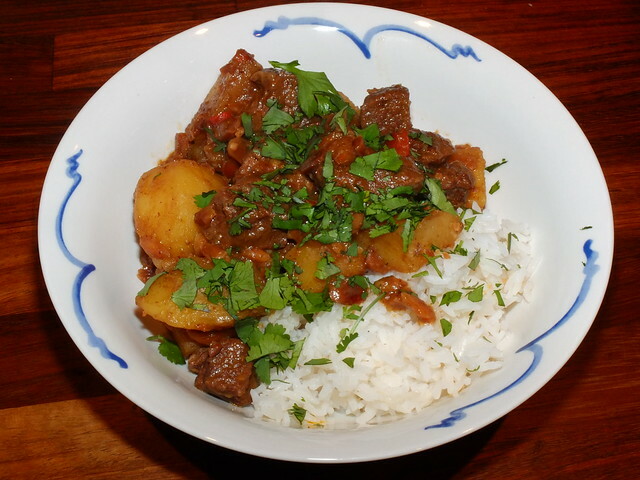 Then I added in the coconut milk and simmered until the meat was done and the potatoes soft. Then, I added in the creamed coconut and let in heat through. You need a fair amount of sauce, because you want a soupy consistency. I served the curry with crisp shallots and jasmine rice.